Featuring 18 popular hymns sung by the Homecoming Friends and a 23 piece orchestra. Bill and Gloria Gaither have been busy again, this time in Nashville where they gathered The Homecoming Friends together to sing more of your favourite hymns and songs. This release was recorded as a follow up to the popular 'Hymns' and 'Church In The Wildwood' recordings. Over 150 friends where present including Ernie Haase and Signature Sound, Lynda Randle, The Isaacs, The Martins, Ivan Parker, Janet Paschal, Russ Taff, The Crabb Family, Andrae Crouch, Jessie Dixon, Larry Ford, Joy Gardner, Brenda Lee, The Oak Ridge Boys, and Randy Owen (Alabama). 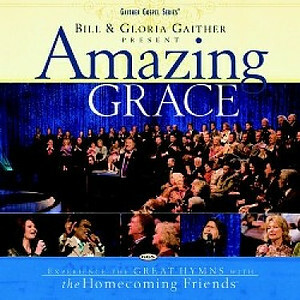 Amazing Grace CD by The Homecoming Friends was published by Gaither in August 2007 and is our 14219th best seller. The ISBN for Amazing Grace CD is 0617884272524. Be the first to review Amazing Grace CD! Got a question? No problem! Just click here to ask us about Amazing Grace CD.